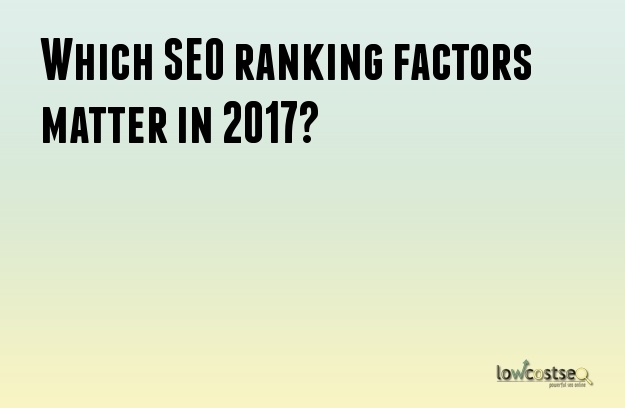 Which SEO ranking factors matter in 2017? Google and other search engines are constantly refining and changing the way that their algorithms work. After all, since technologies advance and change, there is naturally going to be a change in the way search engines will work as well. There are also various industry and market trends that could affect search engine rankings as well. And if you are wondering what those search ranking factors are, and which are more relevant in 2017, then you have come to the right place. If you want to know which kind of site factors can affect your own site's search rankings, and then read on below. Here are the top SEO ranking factors for this year. It is found that most of the domains in the top positions in web searches for specific high volume keywords are very secure sites. It is recommended that more sites switch to using HTTPS as a way to better up the security on their site. It could help their search rankings if they switched to using the HTTPS security protocols. The longer the length of the content on the site, then the better it will do in search engine rankings. Most of the content of the sites that are found in the top positions in search rankings have got on average a higher content length when compared to the other sites in the lower search ranking positions. This does not mean that you should just write lengthier content to rank higher, it is important that you write the appropriate length of content that is actually relevant to the search topic of the user. If your long content does not have any value at all, then the length of the content may actually end up harming your search ranking instead. You would actually be surprised that most high-volume keywords do not even appear in the titles of site pages that are in the top search positions. This will mean that stuffing the keyword into your title no longer is relevant for SEO tactics anymore. This is because search engines are better understanding the content of searches and the meaning of the article content as well. Links also do not contain keywords anymore. Most of the links that are relevant to a site's search rankings no longer have to contain the keywords in the anchor text. This has meant that keywords in the anchor text are not a big factor for your search rankings anymore. And it is best to limit the use of keywords within your articles. For high-volume keywords, the amount of traffic that is coming to your site will affect its rankings too. The general rule of the thumb is that with more traffic coming to your site, you will also see a much higher search ranking for it as well. And this means that if you want your site to do well in a high-volume keyword niche, then you need to try and work on increasing the amount of website traffic that you are getting.